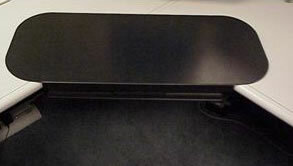 Description: The Big Board Keyboard Tray features both right and left mouse options in one tray and is attached to the underside of a desk surface. It provides adjustments that assist in positioning arms and hands in a neutral position. 27” Wide. 25” also available. Ergo tips: If you are under 5’4” and working at a standard height desk, a keyboard tray that sits below the desk is a key tool for you. Make sure you get a foot rest! Description: The keyboard tray is attached to the underside of a desk surface and supports a keyboard and mouse. It provides adjustments that assist in positioning arms and hands in a neutral position. 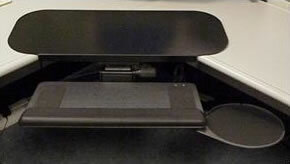 Description: The Microsoft Natural keyboard tray matches the shape of the Microsoft Natural Keyboard and keyboard elite and is attached to the underside of a desk surface and supports a keyboard and mouse. It provides adjustments that assist in positioning arms and hands in a neutral position. Description: The corner extender is designed to provide additional desk space in the corner of L-shaped workstations. It can attach to the above keyboard tray to provide a corner keyboard installation. Ergo Tips: If you work at a corner desk use the corner bridge extender in combination with the keyboard tray for the perfect ergonomic corner setup. Description: Combination keyboard tray and corner extender. Ergo Tips: Make sure you set your new Keyboard tray up correctly, with it sloping away from you (a negative angle) to allow your wrists to be straight and your elbows a little higher than your wrists. An adjustable keyboard tray can be a valuable ergonomic asset to for your wrists, arms, shoulders, neck and upper back. For people who work on a computer more than 2 hours per day, a high-end articulating keyboard tray can provide protection from a variety of musculoskeletal disorders, including Carpal Tunnel Syndrome, wrist arm and neck pain, and even upper and lower back pain.